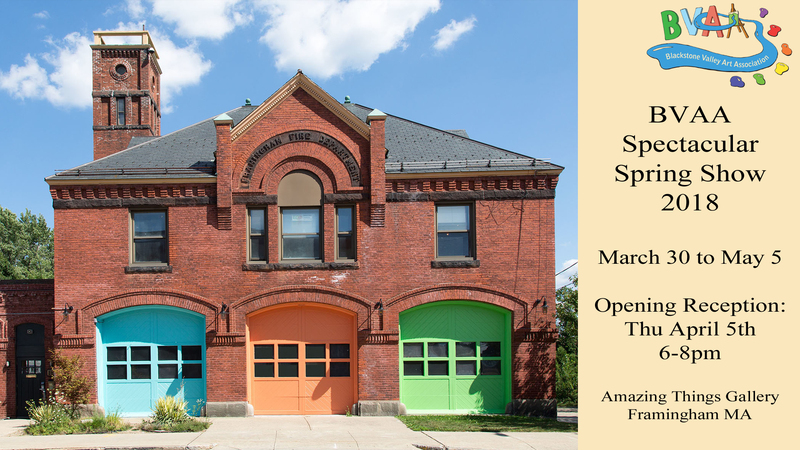 The Blackstone Valley Art Association is sponsoring its annual BVAA Spectacular Spring Show – this is our sixtieth year! The show is open to all BVAA members. If you’re not yet a BVAA member, now’s the time to join us – this is an amazing gallery and opportunity! The entry fee for the Spectacular Spring show, open to all styles of artwork, is $20/3 pieces. The theme is wide open. You can submit a portrait, landscape, still life, abstract, seascape, you name it. Your imagination is the limit. Because this show is judged, you cannot enter anything which has previously been submitted for a BVAA judged show. It’s fine to enter works which have been in non-judged BVAA shows. IMPORTANT NOTE: The gallery’s commission is 35%. There will be no BVAA commission as a result. Please take that 35% into your pricing decisions. To submit your entries use our BVAA Online Submission Form. The deadline to submit is midnight on Monday, March 26th, 2018. Work can be dropped off Wed during gallery hours; it must be dropped off by Thursday, March 28th, 2018 at 3pm. All work which is brought in will be hung (as long as it is properly wired and is family-friendly). When delivering artwork, bring it to the second floor of the gallery. The show must be completely hung on Thursday by 6pm. We always love inventive assistance with our hangings! This is like Interior Design for the Creative Mind! We’d love to have you partake in the fun between 3pm and 6pm – please contact Pam at pwsras1007@yahoo.com to reserve your spot! This show awards cash prizes based on the number of entries received. The judge for this show is to be determined. The time will be either that Friday or the following Tue-Thu between 10am and 6pm. If you aren’t able to make that, contact us for other arrangements. If you have not removed your artwork within two months, it becomes the property of Amazing Things. Note that we will have a sign-out sheet for the artwork, since this is an external-to-us gallery.